Grave was the man in years, in looks, in word, his locks were grey, yet was his courage green. The day of fortune is like a harvest day, We must be busy when the corn is ripe. It is the fortunate who should extol fortune. The Gerusalemme Liberata occupies a larger space in the history of European literature and is a more considerable work. 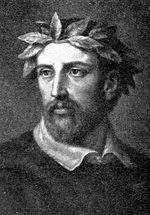 Torquato Tasso (Italian pronunciation: [torˈkwato ˈtasso]; 11 March 1544 – 25 April 1595) was an Italian poet of the 16th century best known for his poem La Gerusalemme liberata (Jerusalem Delivered 1580) in which he depicts a highly imaginative version of the combats between Christians and Muslims at the end of the First Crusade during the siege of Jerusalem. Until the beginning of the 19th century Tasso remained one of the most widely read poets in Europe. He suffered from mental illness and died a few days before he was due to be crowned as the king of poets by the Pope.